I have made it known that I do not believe this issue is tinfoil hat anymore, and that I would be relentless about finding more information. In keeping with that, here ya go….. I know that quite a few people are becoming aware of the Barack Obama Birth Certificate Issue, and the Leo Donofrio suit that is supposed to be in conference with the Supreme Court on December 5th. For those of you that really want to hear about this suit and The One’s eligibility problem from the horse’s mouth, I was emailed this information about Plains Radio, “The Voice Of The People”. Leo Donofrio has done radio interviews speaking about his case against the Secretary of State of New Jersey and what that case EXACTLY entails; specifically her negligence in not verifying the eligibility of presidential candidates to be on the ballot. I would suggest that you listen to Interview listed for 11-18-08 first. Do a search on photos of the deposed and killed-by-his-own-people Italian fascist and dictator Benito Mussolini, and you will see the same jutting chin that Obama has in the graphic you use in this post. the post heard round the world … crossed on little green footballs, real clear politics, and free republic for you. thanks for messaging me about it. have a wonderful holiday! Clyde – You Are The Man! Many Mahalos!!! diamond, something funky on RCP these days – they seem to be filtering articles. lots of people complaining. i posted yours twice – didn’t go through. methinks they are sniffing the dark side. Clyde – I hate to tell you this – but Oh Yeah! Been going on since the election. I think PUMAs are a little bit more paranoid than the rest of the internet community, and I hate to say this too, but you guys are gonna catch up to us soon. TAKE ACTION and DEFEND OUR CONSTITUTION! 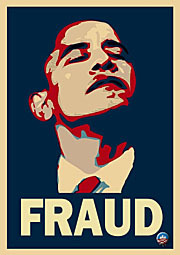 Stop The Fraud by Obama! If Obama gets into office without verification that he has met the requirements of the U.S. Constitution, if you care about life, liberty or the family, you’re going to have to make hundreds of calls to try and fight an agenda that seeks to silence you. There is a way to help prevent this. Our founders sacrificed their lives, their fortunes and their sacred honor. I’m asking you to do three things. Fast and pray for all the hidden things to come to light. FYI The link for the November 19th broadcast goes to the 11-24 recording. Please post if you have room!